Perched on the edge of Grand Canyon in a culturally significant location within view of the confluence of the Colorado and Little Colorado Rivers, Desert View Watchtower is near the place where Hopi emerged from the Third World into the Fourth World and left the canyon for the mesas. 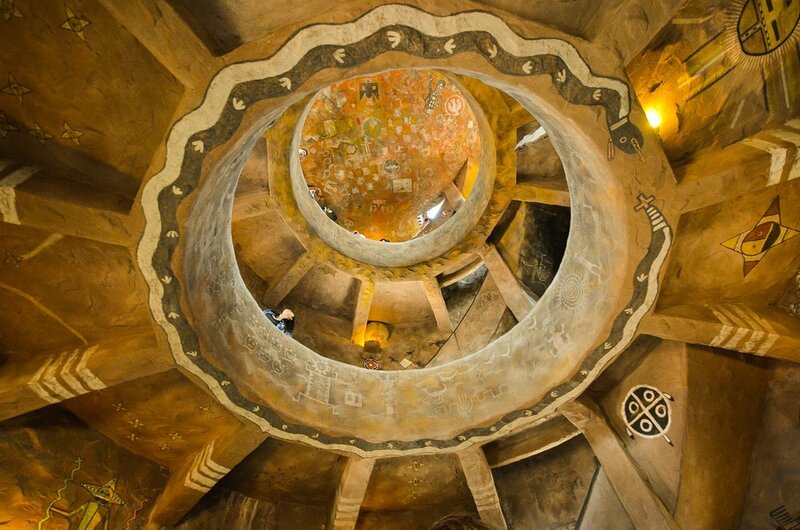 The Watchtower is a 71-foot, four-story building that was completed in 1932 by visionary artist and architect Mary Colter. It was designed to resemble a structure similar to those found within the archaeological ruins of the Ancestral Puebloan people, the ancestors of the Hopi. The Watchtower is composed of a circular coursed masonry tower rising from a rubble base. The base is arranged within a large circle with the tower to the north. Tiny windows are irregularly placed, allowing shafts of light to illuminate the lower space. The main space is the Kiva Room in the base structure, roofed with logs that were salvaged from the old Grandview Hotel. The tower rises as an open shaft lined by circular balconies overlooking the central space. Access from balcony to balcony is provided by small stairways. At the top the space is decked over, creating an enclosed observation level with large glazed windows. The tower is decorated by murals by Fred Kabotie, a Hopi from Second Mesa, and represent the physical and spiritual origins of Hopi life. 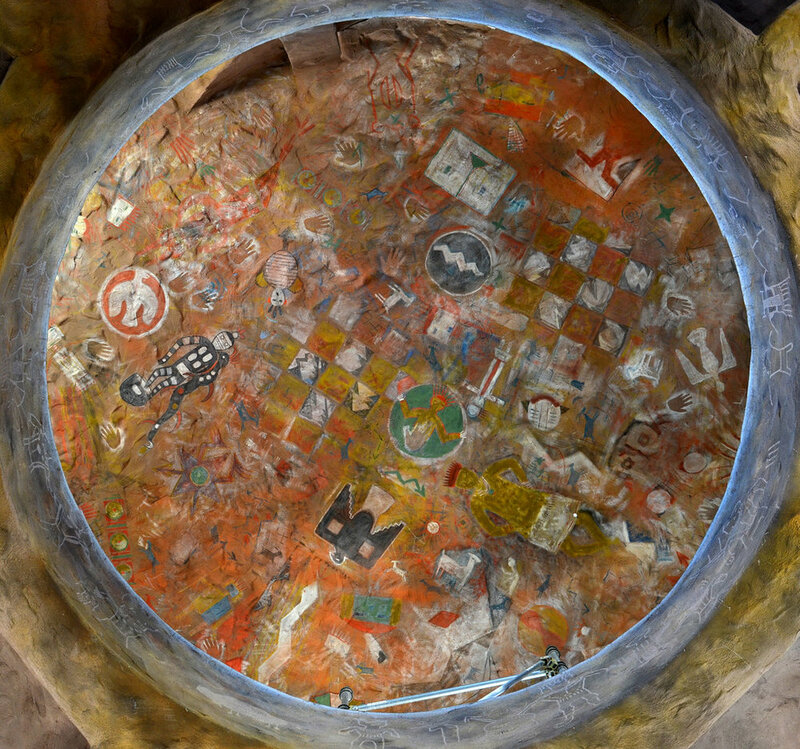 The ceiling images, painted by Fred Geary, are recreations of images from Abo Rockshelter, now part of Salinas National Monument in New Mexico. The acoustic properties of the Watchtower are unparalleled, which is what attracted the musicians to record Ongtupqa inside the historic structure. Eight of nine songs were recorded in the main Kiva Room, and one song, Prophecy, was recorded on the second floor where the resonant qualities of the Watchtower provide natural reverberation for Clark’s vocals. The audio and video recordings within the Desert View Watchtower were allowed by Grand Canyon National Park under a special use permit. All songs were recorded in one-take in a single evening, and no studio enhancements have been made to alter the acoustics or natural reverberation of the space. 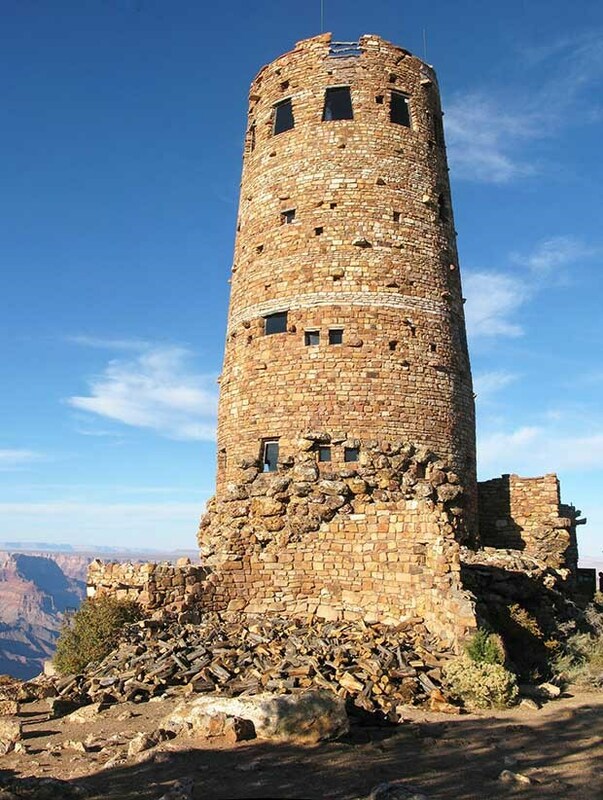 To learn more about the Desert View Watchtower, please visit the Grand Canyon National Park website.